Project 52 is Officially... - Nekaro & Co.
a bust. I did a horrible job of even attempting half of what was on my list. But let's just focus on the positive, shall we? Plant a garden. It was a tiny little thing. Radishes that were too small to eat. Cucumbers that were horribly misshapen. And tomatoes plants that had no tomatoes. Clearly this needs work. Visit the beach. If I didn't do anything else on this list, this one was getting checked off one way or another. Gulf Islands National Seashore did not disappoint. Visit a National Park. I loaded up the whole family and took them on a mini road trip to visit Abraham Lincoln's birthplace and childhood home. It was the most awesome feeling to stand next to Sinking Spring and know that Abraham Lincoln and his family had once stood there too. Create a monthly cleaning plan. I did this. For about 3-4 months. Create chore charts. I did this. Then got tired of having to hassle and remind others to do their stuff so I just ended up doing their chores myself. Redecorate the dining room. I did 3/4 of this. I still haven't made my "EAT" sign yet. Visit the library twice a month. This year Kentucky libraries began online lending! Read 25 books. Ok, I'm counting this as a win, but I haven't read 25 books. I've read 20. It wasn't my initial goal, but 20 books is an accomplishment in my mind. Teach the baby to sign. This is... so-so. She can sign "more", "milk", and "drink", but most of the time she gets "more" and "milk" confused or just does them both. Number 7 on my list... learn to knit. I really didn't think this was going to happen. In a sense, it hasn't. I'm effectively cheating on this one, but like the books, I'm chalking it up to "close enough". On a recent visit to Hobby Lobby with my Mom, she noticed a small, inexpensive little contraption called The Knook. 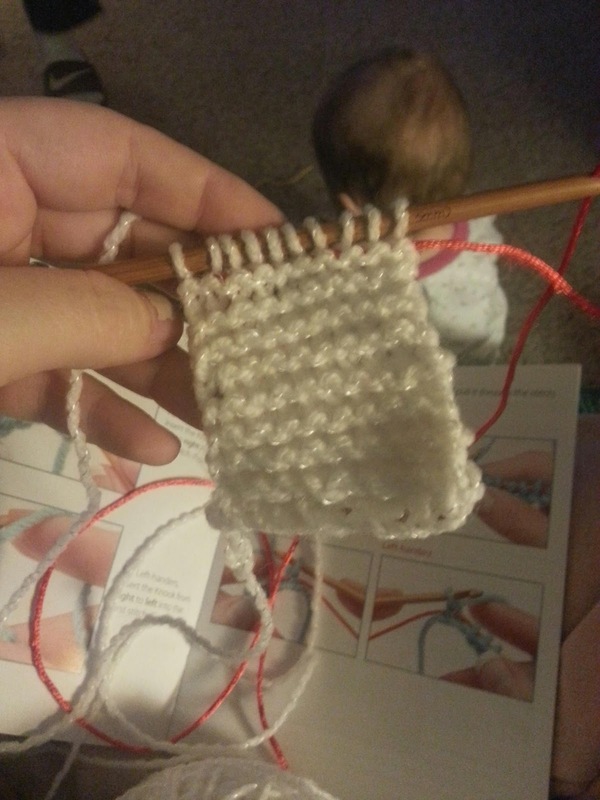 Basically, this is knitting with a crochet hook. She is an avid crocheter, knows how to knit, but liked the ease of crocheting better. She thought she'd give it a whirl. Her knowledge of crochet ended up being an issue because she was trying to crochet the stitches instead of knit them. For me, this is like someone speaking a dead language. Does Not Compute. I do not know the difference between stitches. First attempt... I kept knitting instead of knit and purling. Oops! Thank goodness this little beginner's kit had illustrations! (For left and right handed people!) I had to keep flipping back and forth and reading over and over. But I finally got it! Err... I thought I had it, but it turned out that while I thought I was knitting a row then purling a row, I was actually just knitting everything. Another handy illustration... what your yarn should like like. 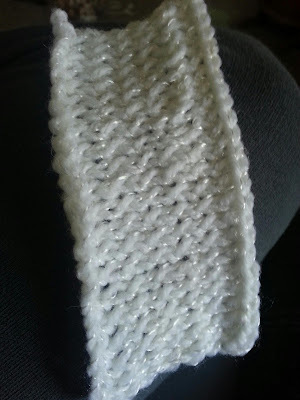 It turns out that if you just knit every stitch, it's called the Garter Stitch. A couple of days later! A few days and a few swatches of yarn later, I can knit a row and purl another! This is as far as I've gotten in my learning process, but practice makes perfect. I don't think I'm ready for any large projects, but let's just say that scarves are definitely in the near future. So learn to knit is getting checked off my list. Even if it's sort of cheating! Did you have a list of goals for 2012? How did you do on your list?